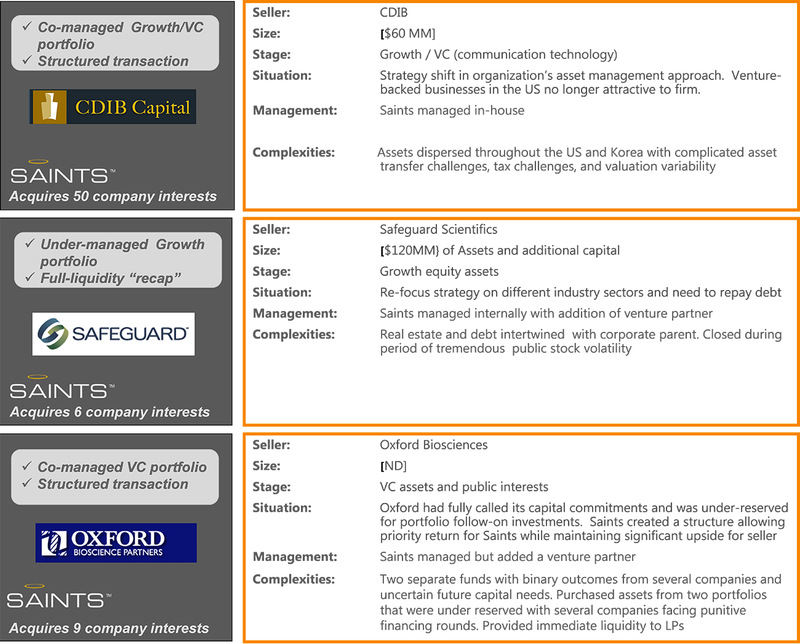 As venture capital funds mature, General Partners (GP’s) of these funds can often face a number of challenges. Saints works with GP’s to mitigate or solve these challenges in an effort to increase the value of the portfolio to LP’s and align incentives with the GP’s. The type of solutions Saints offers to GP’s fall into four general categories. Fund Recapitalizations – Saints offers General Partners a chance to recapitalize their fund. This often involves agreeing on a price (often a discount to current NAV) and offering any LP interested in liquidity cash for the LP stake or offering them a chance to roll their current ownership in conjunction with a modification of the LPA. Recapitalizations often involve Saints providing additional capital for follow-on investments into the exisiting portfolio and often involve rewriting the LPA such that a new fee structure is put in place for the General Partner as well as a new carry structure. An example of this type of transaction can be found here. Partial Sale of fund stakes in portfolio companies – Saints offers General Partners the chance to sell their stakes in some portfolio companies while keeping others. This often raises additional capital and allows the General Partner to focus on its most promising investments. Alternatively, a General Partner may decide to sell a percentage of every company in its portfolio – often called a “strip” transaction. Thereby monetizing a small part of the portfolio, returning capital to LP’s or using money for additional follow-on investments – and derisking the portfolio. Examples of these types of transactions can be found here. Entire Sale of portfolio – Saints offers General Partners the option of selling their portfolio to Saints – this often occurs when there are only a few stakes left in an old fund or there is a legal mandate to liquidate the fund. Examples of these types of transactions can be found here. Capital Infusions – Saints offers a new investment, secured solely by stakes in companies held by the fund, into the fund in the form of debt or preferred LP units. This money comes with a minimum priority return and can be used by the General Partner to invest as it sees fit. These transactions usually require approval by the majority of the LP’s in the fund. Examples of these transactions can be found here. Alignment with an experienced and industry knowledgeable partner (Saints isnt like an LP advisory board, we are experience Venture Capital investors) and as such, can understand and appreciate the decision process surrounding exit timing and follow-on capital.